"...Where Insomnia Hits the Ice: NOW WITH A BABY GIRL!" "Seen the 3rd Round More Than Ovechkin, She Has!" Seriously, look at ALL. THAT. SWAG. courtesy of Magee-Women's Hospital/UPMC/the Pittsburgh Penguins. 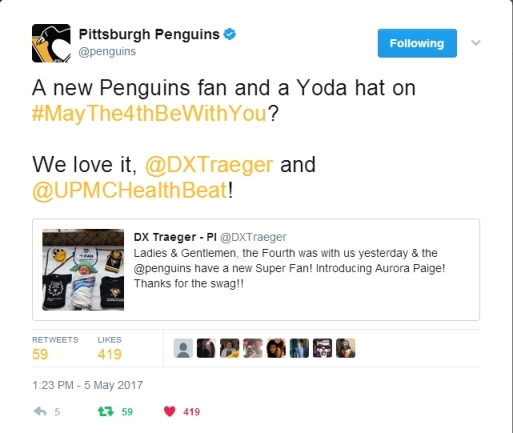 I was excited as all get-out to meet Aurora Paige (she and momma are doing awesome, by the way, and Aurora's sister simply loves her "bae"), and getting all of this Baby Pens gear was simply the icing on the proverbial cake. So, thank you! "Hello, Charles Schwab? Yes, invest everything I've got into POPCORN." 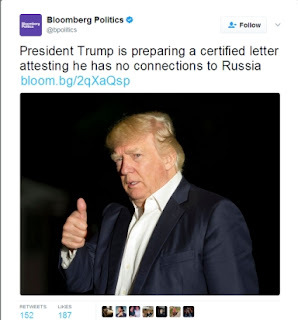 Leave it to the Capitals to challenge Donald Trump for the title of "Biggest Disaster in Washington, D.C."
"Guys, it's CERTIFIED! That's SO MUCH BETTER THAN A BIPARTISAN INVESTIGATION!" Despite having the best record in the regular season (...again), and despite facing a Penguins team missing their #1 goalie (Matt Murray), their #1 defenseman (Kris Letang), and lacking the #1 player in the world (Sidney Crosby) along with Conor Sheary, Carl Hagelin, & Trevor Daley for at least one game during the series, the Washington Capitals are once again going home in the second round, and once again, the Pittsburgh Penguins are the team handing them the golf cart keys. Given that the Penguins once traded the Capitals Jaromir Jagr for the hockey equivalent of a bag of burning poop, it's nice to see Washington on the other side of financial constraints/having to make brutal hockey decisions because of money. Given the obvious decline in Ovechkin's play during the Pittsburgh series and the subsequent reveal of Ovie having the dreaded "lower body injury," the Penguins got to face "the Great 8" at something significantly lower than 100%. Ovechkin's lower production in the regular season (33 goals after scoring 50+ the two previous seasons) can be symptomatic of "buying into the system," a necessity under the Capitals' head coach, Barry Trotz...but it can also be a sign of Washington's captain finally slowing down. 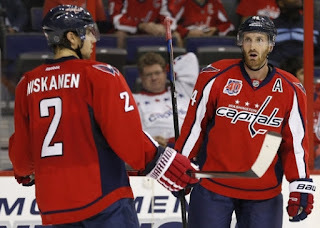 The decision facing the Capitals is whether or not to continue the "Build Around Ovechkin" model, or to take a long-term approach and look to rebuild by dealing the face of the franchise for some kind of unfathomable return (although most likely better than Kris "Freaking" Beech). Either way, the Capitals will regress into the Trotz-led Nashville Predators of yesteryear, with a New Jersey Devils-esque focus on trapping and altars throughout the Verizon Center for fans to pray that Braden Holtby plays like a Latter-Day Billy "Joseph" Smith. Do you realize that Marc-Andre Fleury has now consecutively outplayed two Vezina Trophy-winning goaltenders in Sergei "Regular Season" Bobrovsky and Braden "SOFFFF" Holtby? Fleury backstopping the Penguins to a 5th Stanley Cup– his second as a starter and third as a member of the team– would be a fantastic bookend to a Pittsburgh career and would be the ultimate dagger into the heart of the "Fleury Is Not a Playoff Goalie" narrative. Which reminds me, that entire "FLEUR-Y! FLEUR-Y!" 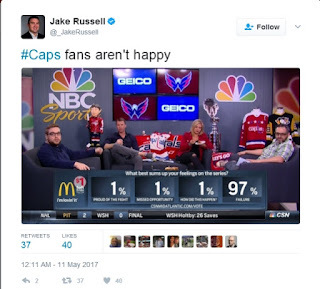 chant at the Verizon Center last night didn't age all that well for Capitals' fans, eh? In any case, enjoy the off-season Capitals fans, and Ovie, I can't wait until you're peddling "Just for Men" products in late night infomercials.